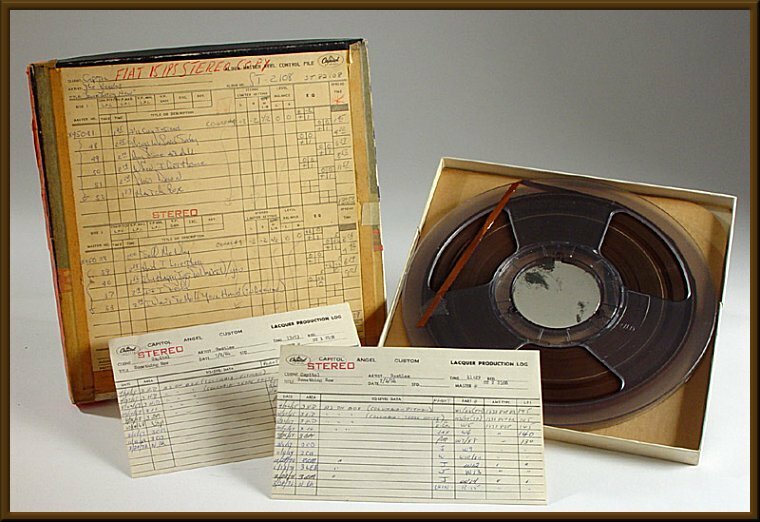 This original one-of-a-kind stereo master reel-to-reel tape was used for the New York production of Capitol ST-2108 Something New by the Beatles. Called a protection copy in the industry, this tape was utilized to produce the mastering lacquers and bears all associated makings. The engineering sound calculations for this famed album are listed, handwritten on the box cover. Each cut is identified by title and duration time. The original Capitol lacquer production log dated July 2, 1964 is included. Truly a FABulous piece of recording history. A similar reel for The Beatles' Second Album (Capitol) also circulates among collectors. It was offered for sale at a record show at The Rock and Roll Hall of Fame a few years ago.